My feet crave touching the earth, toes curving and shaping, muscles coming alive as they meet the nuanced surface. Walking barefoot, ever so slowly, my whole body comes alive with new sensory information, excited by the novelty underfoot – mounds of dirt and grass, pine needles and pebbles, cool water. In only a few minutes, I am pulled into the moment, mindful of each step, legs extending tentatively to feel this great other. I become longer and more upright, responding to the felt experience of being supported and met in this communion, being to being, a wild unmediated conversation. My soles – and my soul – awaken to the moment, hungry for aliveness, improvisation, wild possibility. The cells of my body, the cells of my feet, yearn for this contact with matter, with Mother, to feel the us of intertwining together, My body feels calmed and nourished, my thinking mind stops, touched by this cellular interchange, the felt presence and support of the earth. 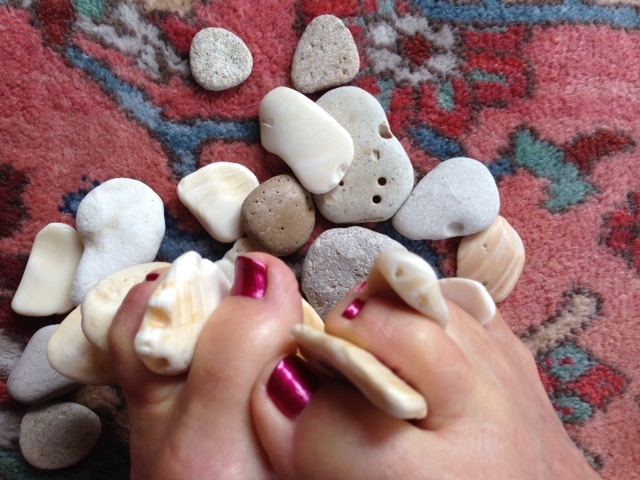 Barefoot, our connection is tangible – I feel myself as a child awake to wonder and play, to the mystery of the yet explored. What have we done, with our hard shoes lifting us off the earth and our concrete sidewalks? We have sealed ourselves off from feeling our everyday interrelatedness, become oblivious to her presence. We have bound our feet, distorting their natural ability to sense, and thereby cut off our receptivity to the wisdom and nourishment of Mother Earth. We have lost our ground. We have lost the magic and wonder of being wildly alive in the moment. There is the possibility, the necessity, that we can reawaken our sensing body and begin to tangibly feel the communion that is waiting for us, a felt interconnection with the intelligence of the earth. And we can reclaim the feeling and knowing of our inherent wholeness. We only need step into our animal self, to the sensing ability in our soles that the four-leggeds have, hugging the earth with every footstep, to begin to re-member our sensory interconnectedness with Mother Earth . . . just a few minutes at a time, slowly awakening to the wonder and love underfoot. I think from there more possibilities will emerge, as our feet begin to crave more connection. I’d love to hear your barefoot revelations. When I remember to have that aliveness in my feet I can immediately notice that the earth is not still or flat but it is as if I am walking on her flesh. This makes me feel alive! Thanks Sabrina for reminding me of this aliveness just as the seasons turn inward you remind me to turn inward. Yes Mary! The act of connecting is enlivening, and in feeling that we feel more of our own body – and also begin to know the earth more deeply. WE enter into a deeper sense of presence.